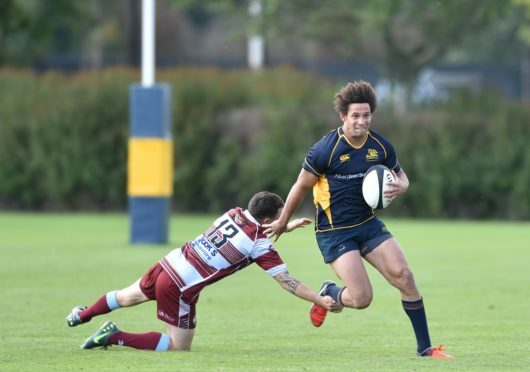 Gordonians remain the only unbeaten team in National League Division 3 but winger Daniel Osugo does not believe the rest of the league is raising their game for the title contenders – yet. Osugo’s side lead the division following nine wins and a draw so far and as they reach the halfway point of the campaign tomorrow against Orkney at Countesswells, Osugo is braced for a more testing second half of the campaign. He said: “I expect teams will target us as the season wears on. Our start has taken the league by surprise, not just ourselves. Gordonians won 32-13 at Ardrossan Academicals last weekend despite not having it all their own way and Osugo is braced for another test against seventh-placed Orkney. He said: “It was a tough shift on Saturday as we let the game get away from us. We completely controlled the first half but we rested on our laurels in the second half and let them back into the game. “We claimed the five points but the performance could be better although we should be pleased we were able to grind it out when things were not all going our own way. It will be another tough game but that has been our opinion of every match we’ve played this season. “We cannot go into any fixture believing it will be easy. Caithness showed a few weeks ago that even though they are not flying high they can be tough opponents and Orkney will be the same. After last week’s excellent 31-22 home win over Hillhead Jordanhill, Orkney face an altogether stiffer challenge against the league-leaders. Orkney coach Gary Coltherd said: “This weekend we face a tricky trip to Gordonians who are undefeated so far. They’ve had one draw and they’ve won everything else, scoring tries for fun basically. “I think we’re going to have to counteract their pace by our ball-carriers taking them on up-front, that could be the way to do it. “We do have players capable of doing just that, although we are missing a number eight and a second row at the moment, that is a wee bit unfortunate. “We’ve got boys who can come in and our plan is to kind of keep it a bit tight and starve them of possession, but we’ll see what happens. “We are sitting comfortably in mid-table, a far cry from where we were just six weeks ago when we were second from bottom of the table.